With competition in the construction industry as fierce as ever, we constantly find ourselves trying to convey to potential clients and industry partners what makes Wise different. At the top of that list are our people and our commitment to quality. Wise maintains a staff of carpenters and laborers, many of whom have been with the company for several years. As a result, we self-perform many aspects of projects including demolition, general carpentry, installation of doors, millwork and drywall and owner requested items when preferable or necessary. Quality Control: Our carpenters and laborers understand the level of quality that our superintendents expect on their projects and know how to deliver. Safety: Our superintendents conduct safety training with the carpenters and laborers before commencing construction on every project, and then again every Friday morning for the duration of the project. 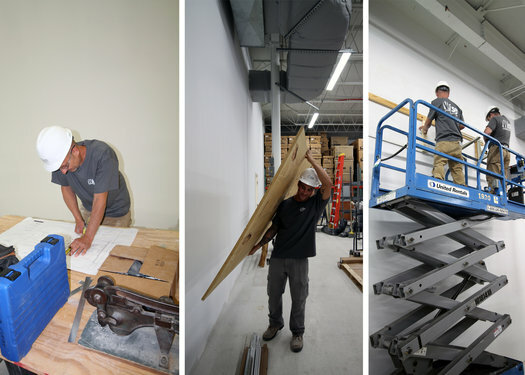 As a result, our carpenters and laborers have received extensive safety training and fully appreciate the importance of adhering to the strict safety guidelines. Responsiveness: Should an unexpected situation arise, Wise can mobilize faster than a subcontractor to respond. This ability to respond has proven helpful in meeting scheduling goals. During the bid process, we compare the cost/schedule benefits of self-performing versus contracting outside vendors. We work with the project team to determine the best option for the project. Because we self-perform we have a large dedicated warehouse where we store materials and tools. This provides us with control over inventory and the ability to prefabricate items. Many jobsites within Boston and Cambridge are in occupied areas, and have little to no laydown space for materials. The warehouse gives us the ability to pre-order materials for the entire duration of the project upfront, and use the Lean Construction method of ‘just-in-time delivery’ to truck in just what’s needed for the day. Daily material quantities fluctuate frequently, due to unforeseen on-site conditions, so each Wise project team keeps a minimum of a four-week look-ahead schedule. This outlines what work will take place in the weeks moving forward, and what materials are needed. The flexibility of the warehouse allows the team to order large materials at once during the start of the project, reaping the benefits of discounts from placing large orders, and keep inventory along the way. If more materials are needed than previously thought, the team will know well in advance. Our warehouse, our people, and our ability to self-perform aren’t anything new to Wise, but they do set us apart. If you have previously worked with us, you know we are pretty particular group. That’s born out in the mantra we’ve followed since our founding in 1984 – “expertise precedes expansion”. If you haven’t worked with us before we look forward to introducing you to our team. Referrals and repeat business account for more than 85% of our work. That, in and of itself, will tell you a lot about the experience and the difference in working with us.